One of the best things about having made climbing films for some years now is that we get to work with people again and again in different places around the world. I was looking forward to the current shoot with Sonnie Trotter and Cory Richards because because working with them is just plain simple good fun. Sonnie and Cory. Caption competition? Truth is that I wasn’t really expecting Sonnie to be back in Scotland trying Rhapsody this spring. We had planned it long ago, but Sonnie is too modest a man to mention on his blog the setbacks that he had this spring. Malaria, then a back injury and then work, all conspired to keep him off the rock for a prolonged period. At last, very late, he got back to climbing and found some form. 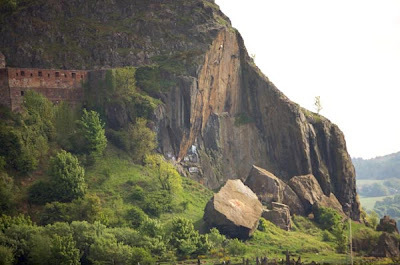 So another visit to Dumbarton Rock was on. Cory Richards’ preparation was even worse. 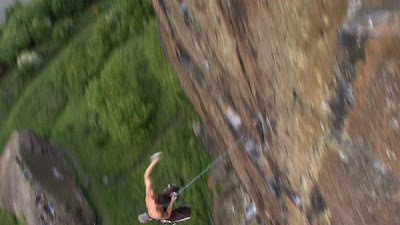 ‘8 months on the couch’, and now he is here to climb a route way harder than anything he has ever climbed before (on bolts, or trad). Cory is a photographer, and trips are always photography first and climbing second. 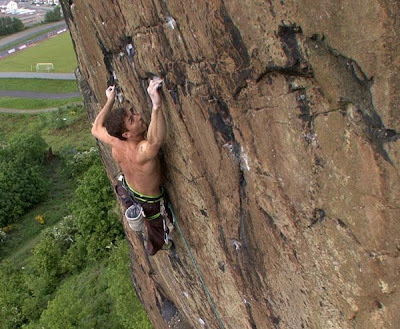 But this time is different, and so for both guys the visit to Dumbarton is really about refinding their climbing mojo and regaining fitness. I think I’m actually a bit jealous. This year has all been filming first, and climbing last. To take three weeks off to focus on a superb route; now that would just be heaven. 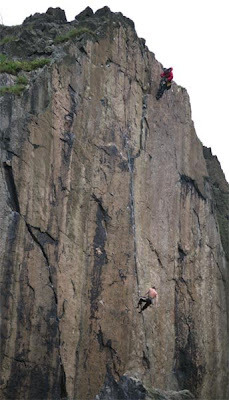 It is hard for high profile climbers to go about their task anonymously. The internet has been buzzing with reports of the guys’ progress. Each day at the crag a friendly and enthusiastic crowd gathers. 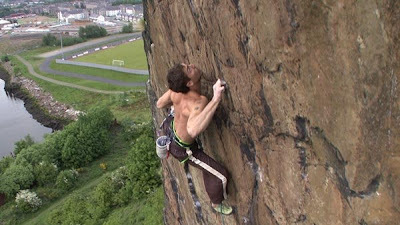 Sonnie has also been giving his perspective on his climbing and all things Scottish on his blog. The weather has been exceptional this year. Every day has been dry. Normally we will get a good week in May, but not a whole month. But the truth is that climbing conditions have been quite poor. It has been hot and everyday the wind has been from the east, meaning that the headwall has been sheltered by the castle. Then at last, late on Thursday really good conditions did finally arrive. Unfortunately Sonnie had already blown it. And he was mad. Really mad. And yes, quite rightly so. He had warmed up on the route while it was still hot and lost too much skin. Now conditions were perfect. Up on the headwall I filmed as he powered his way higher, looking composed and comfortable. Then as he traversed towards me into the crux I saw that he had his finger tips taped up. The fall was almost inevitable. But Sonnie’s rationale was good. A small chance of success, but more likely he will take that big fall. Becoming comfortable with the fall is essential for success. And so, to emphasis the point, he pulled up, and climbed through once more, falling from even higher. The progress of Cory on Requiem is pretty inspiring. Each day achieves a piece of progress, a sequence refined, a longer link, a gain in stamina. So now there are just a few days left. 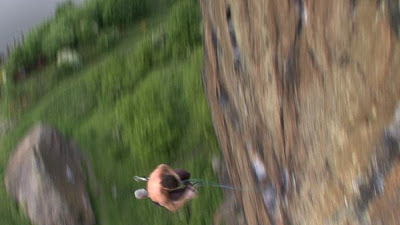 I have no doubt that Sonnie can climb the route. Whether he will, in the time he has left, is far from certain. But that is good. If outcomes were certain, then they just wouldn’t be interesting. The climbing ability is there. Success is down to tactics, timing, strategy, conditions and of course luck. Interestingly Sonnie has found two additional lines up the Rhapsody headwall. Some may think this is a big deal, a more direct finish rather than the left then right of Rhapsody. But the Rhapsody sequence is superb and Sonnie is following Dave’s sequence hold for hold. So maybe the headwall will also get a new direct finish as well. We shall see. The forecast remains good. Hopefully skin will last out the week. Hot Aches are working with Sonnie Trotter on a number of routes for what will be one of 4 new films destined for DVD release this autumn. Highly impressive. Thanks for the input on here, very well put together, it's been great reading thus far, and I'm certainly buying that DVD, and will look forward to some quality viewing. It's funny, I spent so many weekends there, yet do not recall noticing that rock. I wasn't a climber then mind; but was actively mountain biking and jet skiing on Loch Lomond, beautiful area and the best of Scotland I have to say!